ECTmmo.com- MMO Blog: The Adventures of Kaozz...: Catching Up! Lots of neat stuff popping up since my last blog post. Rift has a new water themed xpac out that I decided to dive into, (literally!). Trove has had some really great updates. 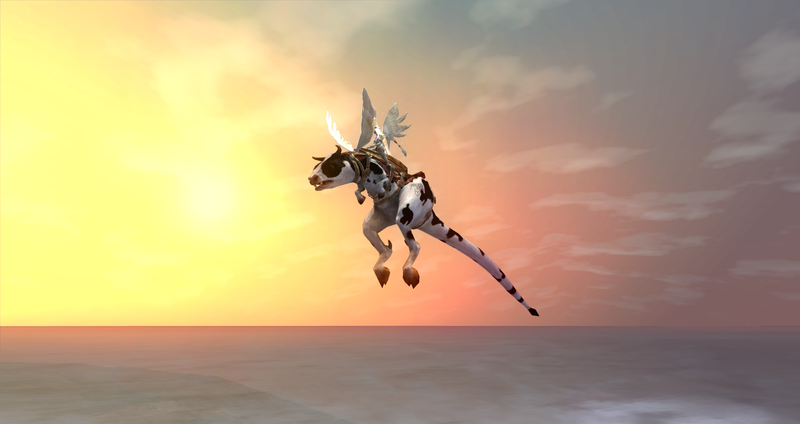 I managed to hit the cap in EQ2 and work on an actual alt. Warcraft had some updates, but nothing serious- yet. I managed to hit the cap of 100 in EverQuest 2 a few weeks ago. It wasn't bad and I did mostly grinding to get there, which I don't mind. I found the new quests very linear and decided I'd rather just grind the last few out. So my channeler is 100, I like the class a lot but she needs some gear upgrades in time. I'm glad I finally got her to the new cap, it was worth it and enjoyable. Then we had a double XP weekend over the Easter holiday. So I managed to work on my baby beastlord and get her around 40 and also snag a berry (pink cow t-rex hybrid thing pictured to the right) bovich for Bristlebane day! The beastlord is a very fun class but the mechanics are very similar to the channeler due to the use of an alternate resource. So I decided to level up a bard, a dirge to be exact. I really love the class and she is currently waiting on some rested to get to 85 for flying. She is 83 now. It has been fun going through old content with her but I am very ready to fly with her. The leaping and gliding mounts are just not cutting it for me these days. I could have boosted her to 90 but I thought it would be a lot of fun to work on a new character from scratch, and it really was. I got to see a lot of places and even met a few nice people along the way. 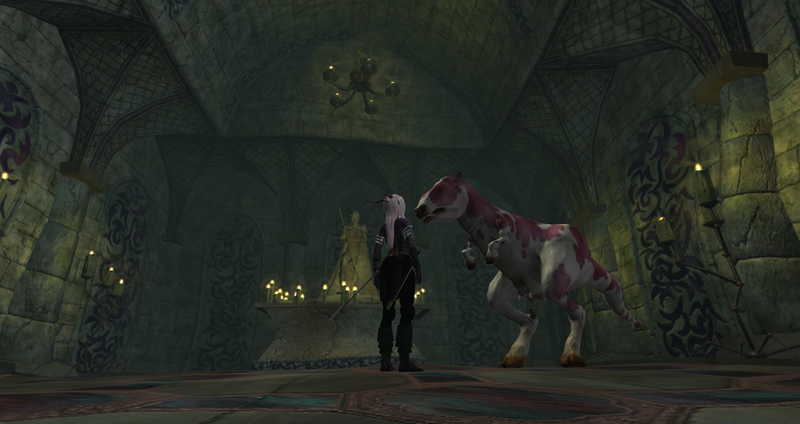 I am enjoying EQ2, I love the housing and how much there is to do, I also love mercs, they help so much with leveling. I managed to get my channeler two elite mercs not too long ago- Perrin and Kenny. In my opinion Kenny is the better of the two. I have looked for the elite mercs for so long and never found one, so it was amazing to get two in the same evening (Perrin requires a prequest for language to hire him, Kenny did not). Then a few days later I was bumbling along in Nek Forest with my dirge towards a quest I saw in the distance, only to find it was Kenny up again! Which helped a lot with her leveling, he is a decent healer. If you haven't been able to find an elite merc in the past, keep your eyes peeled, I think they changed the spawn times so they can be obtained easier. Even a guild member got Kenny a few days after I did. Trove is such a charming game that keeps getting better and better. We recently had ships and fishing added. Love the ships, there is a whole biome full of all kinds of pirates and treasure to loot! The water between land now offers many lairs as it is a biome type now and not just an annoyance to pass over! Fishing is very basic and simple, much like you find in Rift or WoW. You must buy a lure though, which are pretty cheap. There is also a new pirate class, it is awesome! A very fun and solid class. This one comes with a shoulder pet which doesn't only attack, but it flys off your shoulder and arms a cannon to shoot at enemies! The class has a lot of staying power, I like it a lot more than the last class released. There are also new costumes, hair styles, lairs, mounts and cosmetics that have been added in the last few weeks. Lots to check into. I almost missed out on the elephant animal cookie mount! Currently there are two phoenix mounts out, grab them while you can, they can drop off of any mob boxes. There is so much I want to do in WoW with alts but I just feel so exhausted doing the same content over. It isn't bad really, I just don't feel like leveling up again and working on another garrison. I wish we shared one with all kinds of things all alts could use. My hunter is 95, which is my highest alt. I mostly log in to do some pet battles for the daily, check the garrison a little bit. I have gotten some nice gear and weapon upgrades on the main with this, which I like a lot! I think when the new patch is released with the high end area, it will be more fun to log onto my level 100 and actually do something new. Because currently things don't feel very exciting. The patch is on test so hopefully we see it soon! 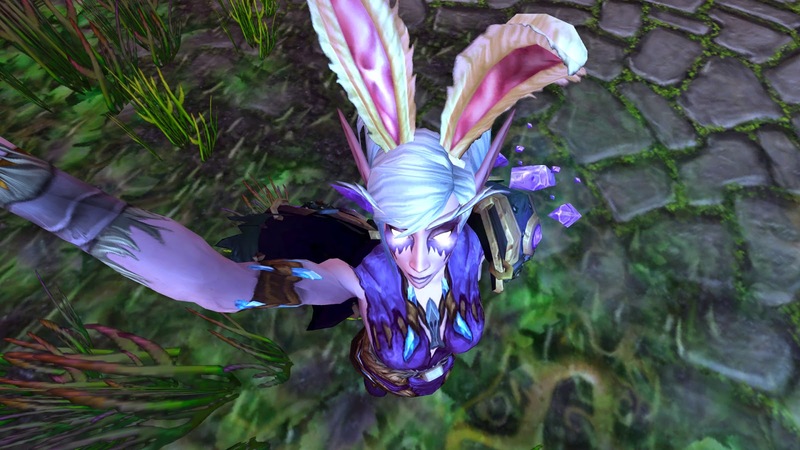 Easter was interesting because I got the bunny polymorph spell with my mage. There was also a new pet, a pot of flowers that hovers in the air and follows you around. Very pretty and strange at the same time. For now I am patiently awaiting the new 100 area! I didn't feel like going back to Rift for a bit but I always miss it. It is a very beautiful game and in some lighting it reminds me of my days in Vanguard. I think it is the open areas that seem to go on and on, unlike EQ2 where many places make the player feel as if they are surrounded by playdough mountains (not so much the new areas which are very beautiful in EQ2). I have been missing my characters and wanting to try the new content so I decided to give it a whirl. My Rogue was the first one to dive into the new underwater zone for the expansion. She hit 61 pretty fast then I missed my 50 cleric and have been working on that one a lot. The cleric is just my favorite out of all of them, so I am working on leveling it too. My mage still sits at 57. At first the rogue was slow and took forever to kill things, but I swapped to a couple of builds and started using some macros I found on the web and things sped up a lot. If you have problems with slow kills, give it some time to get upgrades which help as well as researching specs. The pet/ranged build preset in the game is also a good solid build for leveling which isn't dependent on macros, that is a solid option. As for my cleric I mainly rely on a heavy druid build with a pet to level. It suits my playstyle very well. The spec has a lot of things to cast and use so a macro helps a lot. Great way to level solo and through instant adventures. We also have a new wardrobe system in Rift!! It is so wonderful! Everything unlocks once you loot it, you don't even have to equip it! Account wide as well! I freed up SOOOOOOOOOOOO much space, which was a big reason I got tired of logging in, tired of managing my overflowing collection of clothing. Now WoW needs to do this, my bags and bank are horrible. HOW MANY TABARDS DO I NEED? Apparently a lot. The housing is a plus and I have a reason to work on it with the new-ish minion system, which is very similar to the garrison except I can do it anywhere. I get so many dimension items and crafting items, this is such a great addition to the game. Rift has really turned into a nice, well rounded game which offers something for so many different types of play. Trying to catch up with so many thoughts I've been meaning to share. Also I wanted to mention the passing of Steve Pierce, a former EQ2 dev, and the owner of the game Onverse. In March he was in an auto accident, which he suffered from much trama and didn't recover. He was a really cool person, even though I didn't know him personally I did have communication with him with account and support issues. He was always very great about that, personally responding himself. An all around swell guy and he did some great things with Onverse, you could see how much he loved the game and the players adored him. There is a Go Fund Me page dedicated to helping his new wife whom is pregnant with their first child, you can check it out here. You can read more on the official forms about the future of the game here. He will surely be missed! !